This is the second post in our series on 10 things we learnt from very successful chefs. Our second is Sang-Hoon Degeimbre, a self-taught chef who is considered to be one of the most innovative chefs in Belgium. His story is an inspiring one because he cooked for the first time in his own restaurant calling it ‘the bluff of his life’. He has now been cooking there for the past 17 years, has 2 Michelin stars and it is one of a handful of restaurants in Belgium growing its own produce. He is known for his inventive combinations of uncommon ingredients and constant innovation. 1. Creativity comes from constant questioning: At this level, creativity is essential. But there is no magic formula for creativity. Not being trained as a chef means that you are constantly seeking answers to your questions. Sang-Hoon believes everyone is born creative. But what is necessary is to keep and open mind and have an interest in everything. We all want to create something but it is not always easy for many reasons. Cooking is one way that enables you to be creative. Even by cooking an egg, you are creating something which you can be proud of. Sang-Hoon always tells his team that you need to keep an open eye and have an awareness of what’s around you. You need to apply things from everyday life. You need to remember that everyone has enormous potential. We need to use each and everyone’s intelligence to capture what we know and be creative. 2. When there is a will there is a way: Sang-Hoon Degeimbre never cooked in a professional kitchen before the night he opened his restaurant 17 years ago. He had always imagined opening a restaurant but he never expected to be cooking for the first time in a restaurant on the opening night of that restaurant. On that first night, he did not take the simple route either. He had an à la carte menu and he recalls everyone ordering different things. He still remembers that night vividly, the smell, the feeling and even where the people were sitting. But that first day was just the start of a journey which continues to this day. 4. 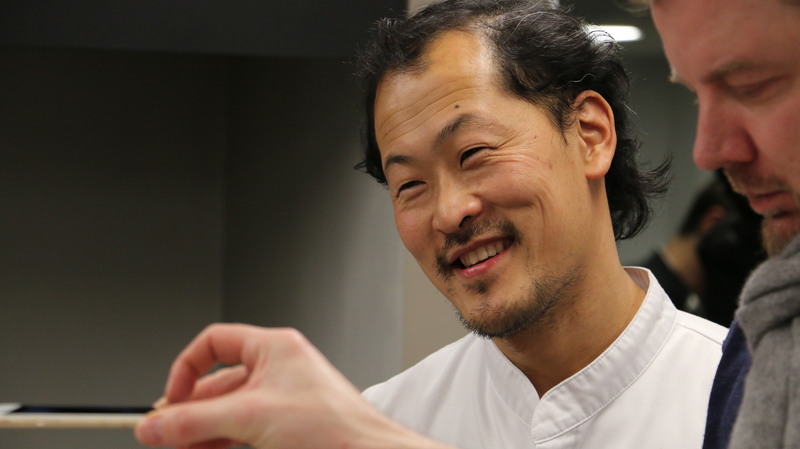 Follow your passion: Sang-Hoon loved cooking and always wanted to have his restaurant. But as he himself says, no one wanted to give him a job in the kitchen. At a later stage. he did not want to train with a chef because some come with very strong characters and he always thought it would not be easy to work with someone with such a personality. But he knew what he wanted and he went for it. 5. Constantly experiment and evolve: In life you win some and you lose some. That is really an important lesson to remember. Life is a journey and you may know where you want to go but you are not sure which direction to take. Don’t hesitate to take detours, to go in directions where the results might be totally different to what you expect. But never settle. Continue to innovate and be creative because that is how you can continue to evolve and discover new things. 6. Less is more: Many times we complicate things in life by adding various elements which tend to make matters much more complex. But like in design, something great sometimes comes from less not more. Sang-Hoon uses wine as an analogy. If you go deep into French wine, you can spend your whole life trying to learn about it. And it will not be enough. Focus is therefore essential. Focus on one thing and push it as far as you can and see what happens. 7. Observe, listen, absorb, understand: These are Sang-Hoon’s mantras. They may sound simple but in today’s hectic life we may not even have the time to observe, listen, absorb or let alone understand. But for anyone working in the creative fields, these four elements are always essential. 8. The importance of teamwork: Everyone mentions the importance of teamwork. And by teamwork he does not just mean the people working in the kitchen but all his team. Staff need to be able to tell the story of a particular dish. They need to be able to explain to the customers how it came about, how it was created. That can only come from great teamwork. 9. Love what you do: Anyone who follows Sang-Hoon on social media knows that he loves his job and what he does. He says cooking is about art, biology and gastronomy and it is the richest job in the world. Maybe not everyone will agree with him about cooking being the richest job in the world but what is sure is that you need to love what you do because this will always be visible in the end result. Having had the pleasure to watch Sang-Hoon work in the kitchen twice, I could immediately understand what it meant. And it was always visible in the end result.